Arrive at Beijing . Our guide will meet you at the airport & transfer to your hotel. Free at leisure for the rest of the Day. Full Day trip to the Tian"anmen Square , the Forbidden City, the Temple of Heaven . - The Forbidden City : The largest imperial palace in China for 24 emperors" reign during the Ming and Qing dynasties with a history of around 600 years. - The Temple of Heaven : a masterpiece of architecture and landscape design where the ancient emperors used to pray for the God"s bless of the whole nation. Full Day trip to the Great Wall, Ming Tomb. Enjoy a famous Peking Duck Banquet for dinner. - The Great Wall : One of the great wonders in the world and the symbol of China . - The Ding Tomb : an underground palace for a Ming-dynasty emperors' afterlife. - Hutongs : the unique street design in Beijing C some crisscrossing old narrow paths with courtyard houses built on each side. It can be regarded as a window into Beijing folk life. Visit the Terra-cotta Warriors and Horses, the Bell Tower and the Wild Goose Pagoda. - The Terra-cotta Warriors and Horses Museum : one of the most important archaeological finds in the 20 th century; an army of terra-cotta warriors and the bronze chariots entombed in vast underground vaults at emperor Qin"s tomb since 2200 year ago. - The Bell Tower : first built in 1384, the largest and best preserved of its kind. 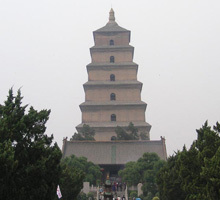 - The Wild Goose Pagoda : the city emblem, which was first built in Tang Dynasty for the storage of Buddhist scriptures taken from India by Monk Xuanzang. Take a morning flight to Lhasa . Be met and transfer to hotel. Free time for acclimatization. 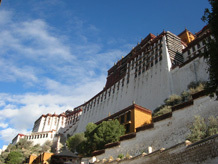 Full Day tour to Potala Palace , Jokhang Temple and Barkhore Street . Full Day trip to Trupeng Monastery, Norbulingka and The Tibetan Dance & Song Show. - The Tsepung Monastery : It is one of the biggest monasteries in Tibet . - The Norbulingka Park : meaning " Treasure Park ", first constructed as a summer palace for the Dalai Lama, and later served as the whole governmental administration. - The Tibetan Family : Common Tibetan people welcome you to their homes, greet you in their traditional way and entertain you with their typical food. 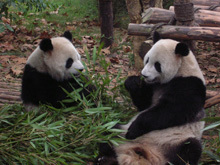 - Giant Panda Breeding Center : First opened in 1987, a semi-wild area where those lovely China "s ambassadors can be allowed to freely roam. Drive to visit Dujiangyan Irrigation System, Qingcheng Mount (cable car included). Take an evening flight to Shanghai . - Dujiangyan Irrigation System : 2200+ year old water conservation project, still in use for irrigation and flood-controlling. - Qingcheng Mount : a famous Taoist holy mountain, together with Dujiangyan Irrigation System were listed as Cultural Heritage by UNESCO. 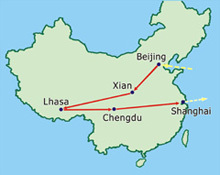 Visit Yu Garden, Jade Buddha Temple , the Bund and Najing Road for shopping. - Yu Garden : It used to be a private garden with 400 years" history, it features traditional architectural style of Yangtze Delta. - Jade Buddha Temple : Most popular Buddhist temple in Shanghai boasting 2 precious jade Buddha sculptures from Burma . - The Bund : Shanghai "s famous waterfront to see new-erect modern skyscrapers and aged buildings of the colonial period. - Nanjing Road : the busiest shopping street in Shanghai . Tour to nearby town C Zhujiajiao, and transfer back to Shanghai , free afternoon. - Zhujiajiao Town : an ancient water town featured with traditional lifestyle of Yangtze Delta. The tour cost on a twin share basis starts from USD2120 /pp (minimum 2 pax) Single supplement: USD440. - Domestic flights and trains listed; - Any meals not specified as "B, L or D". - Admission fees. - Gratuities to guides and drives.